Now for one of the most Innovative creations from MegaStrike Fishing. The 3 inch MegaBug. 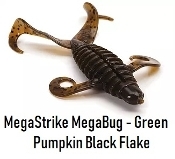 Unlike most of the other beaver style baits on the market, the MegaBug is spewing with action. The claws are flapping the two sets of legs are swimming; it looks like this little bug is scurrying for its life. The body is ribbed and the legs and claws displace plenty of water. The MegaBug is not only a great visual bait but the vibrations are easily detected by the fishs lateral lines. It is a great bait for flipping heavy mats of grass, fishing rocks or heavy cover. This is a big fish bait that just screams EAT ME!